In some cases you may have a user segment that could potentially see several flows in their session. This can typically be avoided with thoughtful user segmentation or event and Appcues history targeting, but as a backup we do offer multiple methods for frequency capping. Account-wide frequency capping dictates the minimum amount of time a user must wait between flows. Linked flows will show in their entirety, but any flows that are unlinked will block until the cap expires. Once you've reach out for us to access this feature, go into the "Account" page from the Settings menu (next to your account avatar). 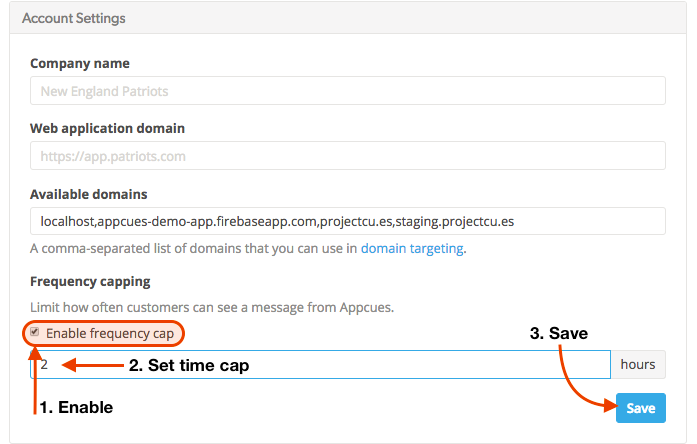 Check the "enable frequency capping" box and write in your desired time lapse between Appcues content. This amount of time will be required to pass between each Appcues flow your users see. For example, if you select "3 Hours" and you have 3 flows that target User A, it will require User A to be on your site/in your app for longer than 9 hours to see every flow in the same session. If it is unlikely for a user to spend this amount of time in their account; the flow will trigger upon the next time they visit your targeted page or when your desired time lapses. A frequency cap will supercede flow targeting. As an example, if you've set a flow to target a user who is logged in for a specific session (ex. 2nd or 3rd time logged-in), if they enter that specific session within the time set for your frequency capping, they will not see this content. At this time, you can only buffer Appcues flows based on time, not on the amount of content shown. If you have content that is linked (i.e., modal links to hotspots or tooltips lead to coachmarks), all linked flows will still show and frequency capping will start upon completion of the last flow. While testing your flows, frequency capping will affect this content as well. To get around this and see what your flows look like live without having to wait for your set time to pass, you can (a) clear cookies while testing your app to reset this time or (b) view your flow with a permalink. The user in our example will not see the flow until they have gone a full 24 hours without seeing Appcues content, but they will remain eligible for higher priority messages that they may qualify for during that time.